Anne Perry’s gift for illuminating the heart’s deepest secrets shines through in her bestselling series of World War I novels. With compelling immediacy, she depicts the struggles of men and women torn by their convictions and challenged by the perils of war. July 1917. Joseph Reavley, a chaplain, and his sister, Judith, an ambulance driver, are bone-weary as they approach the fourth year of the conflict; the peace of the English countryside seems a world away. On the Western Front, the Battle of Passchendaele has begun, and among the many fatalities from Joseph’s regiment is the trusted commanding officer, who is replaced by a young major whose pompous incompetence virtually guarantees that many good soldiers will die needlessly. But soon he, too, is dead–killed by his own men. Although Joseph would like to turn a blind eye, he knows that he must not. Judith, however, anguished at the prospect of courts-martial and executions for the twelve men arrested for the crime, has no such inhibitions and, risking of her own life, helps all but one of the prisoners to escape. Back in England, Joseph and Judith’s brother, Matthew, continues his desperate pursuit to unmask the sinister figure known as the Peacemaker–an obsessed genius who has committed murder and treason in an attempt to stop Britain from winning the war. As Matthew trails the Peacemaker, Joseph tracks his comrades through Switzerland and into enemy territory. His search will lead to a reckoning pitting courage and honor against the blind machinery of military justice. At Some Disputed Barricade is an Anne Perry masterpiece–brilliant, surprising, and unforgettable. Anne Perry is the bestselling author of the World War I novels No Graves As Yet, Shoulder the Sky, and Angels in the Gloom; as well as four holiday novels: A Christmas Journey, A Christmas Visitor, A Christmas Guest, and A Christmas Secret. She is also the creator of two acclaimed series set in Victorian England. Her William Monk novels include Dark Assassin, The Shifting Tide, and Death of a Stranger. The popular novels featuring Thomas and Charlotte Pitt include Long Spoon Lane, Seven Dials, and Southampton Row. Her short story “Heroes” won an Edgar Award. 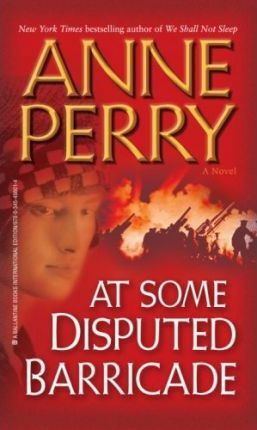 Anne Perry lives in Scotland. Visit her website at www.anneperry.net.